--Birdie Sinclair from Denise Swanson’s new Devereaux’s Dime Store mystery series. My name is Birdie Sinclair. I’m Devereaux’s grandmother and you couldn’t ask for a better granddaughter—even if she is a worrywart. Just because I occasionally can’t think of a word or forget something doesn’t mean I’m senile. But those fancy doctors Dev insisted I go to in Kansas City convinced her that she needed to be around more, so she quit her job as an investment consultant and bought the local dime store. I must admit, I love having her close by, even if I don’t like the way she hovers. Still, she’s had a tough time growing up and I guess she’s afraid to lose the only person she has left. Dev’s father, my son, is in prison for a crime he didn’t commit. Her no good mother ran off to California rather than stick around and face the humiliation of a convict husband. And don’t get me started on what Dev’s douchbag ex-boss did. Anyway, things were going pretty good there for a while. 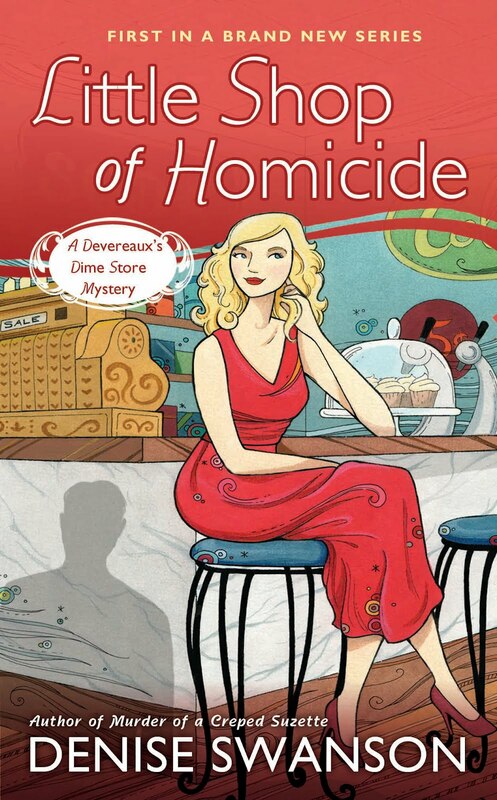 The dime store was real popular, and Dev’s gift basket business was taking off, but then that slutty Joelle Ayers went and got herself killed. At the time, Joelle was engaged to Noah Underwood, and just because Dev used to date him in high school, and the stuff from the hoochie gift basket she made for Joelle was used to commit the murder, the dumbass detective is convinced that Dev is the guilty party. It killed me to do it, but I called my old high school flame, Tony Del Vecchio, and asked him to have his grandnephew help Dev prove she was innocent. His grandnephew is a U.S. Marshal who was wounded in the line of duty. He’s recuperating on Tony’s ranch. I was a little worried that Dev would refuse his help, but turns out the Marshal is as hot as his granduncle. Now if the two of them can solve the case, and get over a few other little obstacles—his job, her ex, and their stubbornness—maybe I’ll finally get to be a great-grandmother. Birdie, you sound like a lot of fun to be around, a little sweet and a lot spicy. I like the idea of a dime store series! Birdie, good thing Dev has you to hover over her! Sounds like a fun idea for a series, with some murder on the side! Birdie, you're a jewel of a grandmother--Dev should be glad she's got you. can't wait to read the whole story! Thanks everyone! Dev is such a good girl. I sure hope readers enjoy her story. There's a lot to tell and we barely started in Little Shop of Homicide. Ohhh, Birdie. I bet you keep a close eye on everything that goes on. I understand -- somebody has to do it. Look at the mess they'd be in without you! I'm looking forward to reading about the excitement in your town. I can't wait to meet you between the pages.